A delegation of eight high-ranking representatives from the Indian Ministry of Environment, Forests and Climate Change (MoEF&CC), the Central Pollution Control Board (CPCB), the national planning committee NITI Aayog and the Indian Resource Panel (InRP) visited Brussels (From Thursday, 26 October to Friday, 27 October 2017), exploring Belgian and European best practices in the field of resource efficiency. The delegation was headed by the chairman of CPCB, Mr. Surya Pratap Singh Parihar. This visit follows the EU India Summit 2017 which was held on 6 October in Delhi. At the summit, leaders from both sides committed to moving towards a more circular economic model that reduces primary resource consumption and agreed to further intensify cooperation on addressing environmental challenges. During a meeting with Bruxelles Environnement on Thursday, 26 October, the delegation learnt about the Brussels Regional Programme for a Circular Economy (BRPCE) and related measures in the field of waste management and the buildings and construction sector. “We are glad to welcome the Indian delegation in Brussels as we see great potential for learning from each other”, said Aurélien Rigolet from Bruxelles Environnement. A subsequent meeting was scheduled with UMICORE – a recycling company in Hoboken which operates a state-of-the-art to smelter for precious metals – to explore possibilities for the application of Best Available Technologies (BAT) in India. On Friday, 27 October 2017 delegates met representatives from the European Commission’s (EC) Directorate-General for Environment (DG ENV). Technical discussions revolved around EU activities in the field of resource efficiency, waste management and the Circular Economy Action Plan passed in 2015. Astrid Schomaker, Director of Global Sustainable Development at the EC received the delegation on Friday 27 October. “We are honoured to receive the delegation of Mr. Parihar and are positive to deepen the on-going fruitful Indo-European collaboration on resource efficiency and circular economy”, she said. The study tour was concluded by a meeting with Recupel, a private service provider which collects waste from electrical and electronic equipment (WEEE or e-waste) on behalf of producers. During this, participants discussed the implementation of Extended Producer Responsibility (EPR) in Europe and under the new E-waste Management Rules, 2016 in India. Before arriving in Brussels, the delegation had met with various public and private institutions in Vienna, Austria and visited the World Resources Forum (WRF) in Geneva, Switzerland to exchange with other decision makers on the implementation of an Indian resource efficiency agenda. The delegation visit was part of a larger EU-financed project on resource efficiency in India (EU-REI) which provides technical assistance to the Indian Government in questions related to resource efficiency and establishes partnerships between private and public stakeholders in India and the EU working on various aspects of circular economy. The project is being implemented by a consortium of four organisations: Deutsche Gesellschaft für Internationale Zusammenarbeit (GIZ), Berlin-based think tank adelphi as well as The Energy and Resources Institute (TERI) and Confederation of Indian Industries (CII) from India. 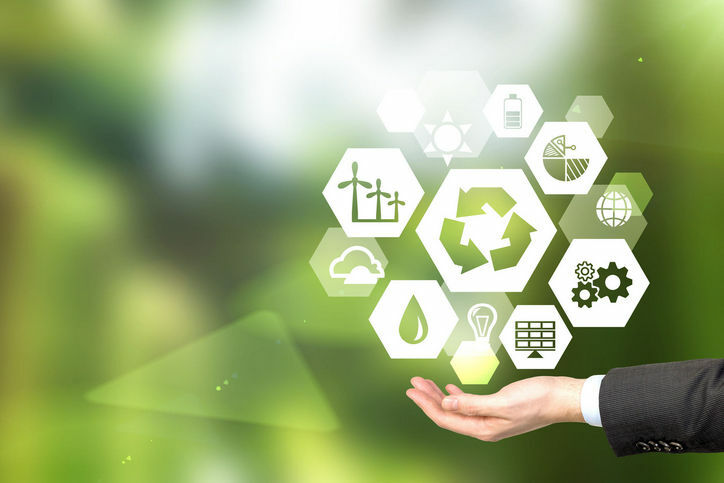 Widespread recognition that Circular Economy approaches are a win-win for the environment as well as growth and jobs has led several countries to adopt strategies for the implementation of such models. However, a circular economy cannot be achieved in isolation. To reap the full benefits of such model, a global transition is necessary. Collaboration and partnerships with third countries will be essential. The Commission adopted a Circular Economy package in December 2015, consisting on legislative proposals on waste and an action plan covering the whole life of products and materials. It is a key contribution to the Commission’s 10 priorities and to the broader agenda of the European Union for jobs and growth. It is also closely linked with the energy and climate policies and it contributes to the implementation of the Agenda 2030 on sustainable development adopted by the United Nations in September 2015. Rising income levels, growing population and rapid urbanisation have led to increasing material consumption levels. India’s raw material usage is expected to climb from 1.7 bn. tons in 1980 to 15 bn. tons by 2030. Between 1970 and 2010, the extraction of primary raw materials to drive economic activity increased by 420%. It is anticipated that India will have the world’s third largest consumer market by 2025, with 30% of consumer spending expected to be in the emerging cities. In transport, housing and energy which are likely to be major areas of expenditure and material consumption, waste management is becoming a significant issue. The consumption of precious mineral and metal resources such as lithium, copper, nickel, lanthanum, cadmium (used in solar panels, electric/hybrid car batteries and motors), and limestone, sand (used in construction/infrastructure) has grown manifold in the last two decades. Recycled plastic and e-waste are secondary resource materials and their recycling saves on the extraction of materials from primary sources. To avoid supply pressures in the shape of price hikes, scarcity, environmental damage, and changing geopolitics, it is prudent to devise a strategy that preserves resources by implementing resource efficiency measures along the entire value chain of products.